Visiting Lush was fun specially with my sister who's a big fan of that store. 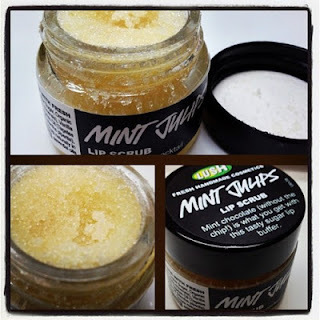 I love trying new things so when I saw this lip scrub on the lush counter I bought it. Since lush is know for it's natural handmade products you can expect good ingredients packed in this item. This product consist of peppermint oil, castor sugar, organic jojoba oil, vanilla extract, tagetes oil and limonene. So my experience with this, what I do is I used it after brushing my teeth at night 3-4 times a week or whenever I feel like exfoliating my lips or doing it. My lips by the way tends to dry sometimes but most of the time it's normal. So after scrubbing my lips with this products my lips looked plump and red like it was so nice and soft. It leaves you with a feeling that there's butter on your lips. Now the smell and taste, when you open the jar you catch a smell of mint chocolaty goody it's the yummiest smell ever for me because I love mint chocolate so I enjoy smelling it while using this product. For the taste since it's natural you can actually lick whatever products is left on your lips. Yes it's edible :) but all you can actually taste is the sugar, it just taste like sugar not any hint of chocolate. So my findings now, This is a good but not great not an HG product for me. This by the way cost 60AED which in my opinion is overpriced for a small jar of sugar. I will not repurchase the product when I emptied it because you can use a homemade lip scrub without spending 60AED there's a lot in google just search what works for you and will give you the same result.